Studying abroad is a great opportunity for students to experience and immerse themselves in another culture and country. While these opportunities are wonderful they are also very expensive. Scholarships are available for students who wish to travel abroad, however not everyone gets them. 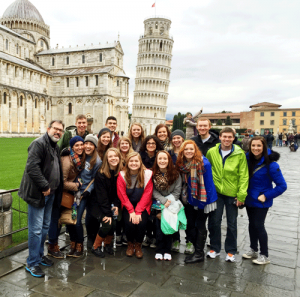 Study abroad fundraisers are a great way to help students offset the cost of the trip or to give them some spending money while they are there. Giving Bean is the perfect fundraiser for individuals or groups who wish to study abroad. Giving Bean’s coffee fundraising program works great for individuals and groups. We have no start up costs, step by step instructions, online support, and fast shipping. Our products are easy to sell since most people drink coffee and tea daily. Freshly roasted coffee, unique artisan teas, and gourmet all natural cocoa are hard to resist. There is something for everyone. With the traditional paper order form you will make 40% as well as 25% from online sales. Individuals can do both the paper fundraiser and the online fundraiser or online only. Our online fundraiser is a great way to reach friends and family who don’t live near you. We also will keep your online fundraiser open even after the paper fundraiser is over. This way you can earn funds throughout the year since customers can reorder their favorite products.